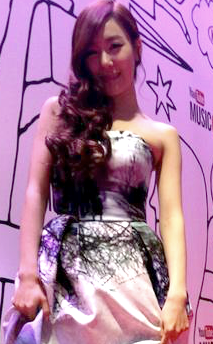 Tiffany at the youtube música Awards. ft Tyler the Creator. Tiffany at the youtube música Awards. ft Tyler the Creator. Wallpaper and background images in the Tiffany Hwang club tagged: girls generation tiffany. This Tiffany Hwang photo contains vestido de la cena, vestido de la cena,, vestido de noche formal, vestido de cena, formal, vestido de noche, sin tirantes, los hombros desnudos, hombros desnudos, expuesto, hombros, and vestido. There might also be dama de honor, vestido de té, balldress, and pelota.